Porsche Junior Sven Müller (Konrad Motorsport) has the Porsche Carrera Cup Deutschland firmly in his grasp: The 24-year-old German has won six of the eight races contested so far and heads into the second half of the season as the points’ leader. As part of the motorsport festival at the Lausitzring he relegated Christian Engelhart (D/MRS GT-Racing) and Nick Foster (AUS/KÜS Team75 Bernhard) to positions two and three on Sunday. “You couldn’t ask for a better weekend. I was the fastest in practice, I set pole position for both races, I won both races and also clocked the fastest lap times twice. I’m pretty happy with that,” said Müller with a smile. Race eight of the Porsche Carrera Cup Deutschland was contested in glorious sunshine and morning temperatures of 27 degrees Celsius. Müller and Engelhart took off from the first grid row, with Foster and Jeffrey Schmidt (CH/Team Lechner Huber Racing) in pursuit. The pilots turned their first laps perfectly with their 460 hp Porsche 911 GT3 Cup, with Müller, Engelhart and Foster spearheading the field over the 24 laps to finish on the podium. “Around halfway through the race I got my chance because Sven made a small mistake. I stuck to his bumper but couldn’t overtake,” explained Engelhart. “After this weekend, Sven now has an eight-point lead. But he can’t rest on his laurels because there are still loads of points up for grabs from the remaining eight races,” said the Bavarian throwing down the gauntlet. The Australian Nick Foster was thrilled with his two third places. The champion of the Porsche Carrera Cup Australia drives for the Team 75 Bernhard, which is managed by the long distance world champion Timo Bernhard and his father Rüdiger. “Timo sent me a text message from the Le Mans pre-test and was thrilled about the points I earned here,” declared Foster. Porsche Junior Dennis Olsen (N/Team Lechner Huber Racing) finished Sunday’s race on position four. “I had a great start and I managed to overtake my teammate Jeffrey in lap two. So I’m still leading the rookie classification” said Olsen. Jeffrey Schmidt (CH/Team Lechner Huber Racing) saw the flag in fifth place. Sixth place went to guest starter Robert Lukas (PL/Förch Racing by Lukas Motorsport). The rookies from the Deutsche Post by Project 1 team, Briton Nicholas Yelloly and Germany’s David Kolkmann, finished on positions seven and eight. Müller heads into the second half of the season as the “half-time champ”. After scoring six victories, the 24-year-old sits at the top of the table with 141 points. On position two with one win and five second places is Engelhart (133 points). 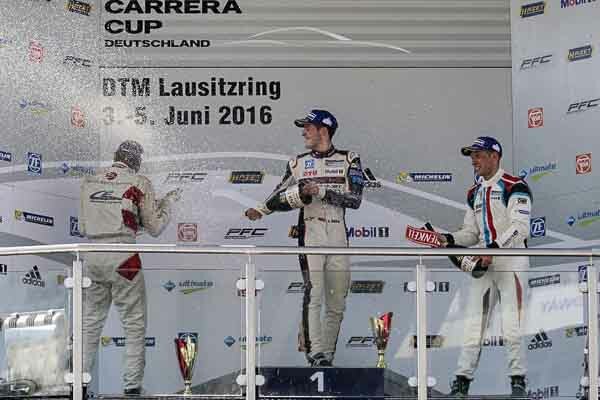 Olsen, who contests his first Porsche Carrera Cup Deutschland season and, like Müller, receives support from Porsche, ranks third in the overall classification with 118 points. With this points tally, Olsen is the best rookie in the field. At round eight, Wolf Nathan (NL/Team Huber Lechner Racing) was the winner of the B-category. Wolfgang Triller (D/Team Huber Lechner Racing) still leads the special classification for amateurs, with Konrad Motorsport ranking first in the team classification. The next race weekend is contested on the Norisring in Nuremberg, with round nine and ten held on the narrow street circuit from 24 to 26 June.